A second appeal has been lodged against a decision to refuse controversial plans to convert a Sutherland church into holiday home. The Parliamentarian Church at Stoer, in Sutherland, was designed by Thomas Telford and is currently without a roof or windows. But the application by Edinburgh-based architect, Guy Morgan, to convert the 19th-century property into a holiday home, received over 80 representations – more against than for. Supporters view it as the last and best way to save the church from total ruin. 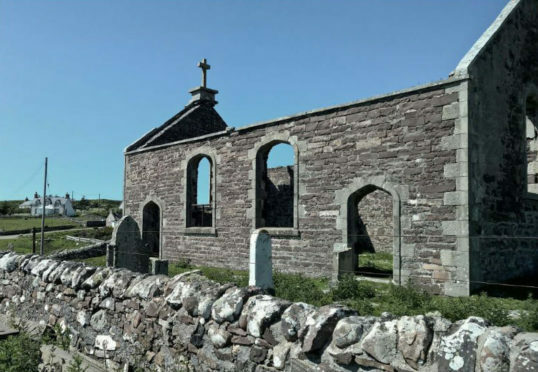 But councillors rejected planning permission in April over fears holidaymakers could disturb the graves of generations of Assynt families, and because it could stop tourists from visiting the church. Original plans to renovate the structure were rejected in late 2016 and Mr Morgan appealed this decision in January last year. Scottish Government reporter Sue Bell dismissed the appeal because of a “tangible risk” that damage could be caused to gravestones through access to the residence and during renovation work, and fail to preserve the setting and special interest of what was, at this time, still a C-listed building. But following the latest planning refusal by councillors, and the subsequent removal of its listed building status last summer, Mr Morgan has now lodged a second appeal. Mr Morgan and his wife Lisa bought the church several years ago after regularly visiting the area and seeing the church in its ruinous state. Built in 1828, it was one of 32 “Parliamentary Churches” designed by Thomas Telford and once had a congregation of hundreds. In Mr Morgan’s latest appeal, he says there are no alternative proposals for the building’s re-use and that none have been proposed since it was first vacated more than 40 years ago. However, some residents have already responded to his appeal which was submitted on July 17. Clare Warwick fears for many of the older residents of Stoer who remember and are related to people in the graveyard, which she says will inevitably be disturbed. Among her other objections is the lack of outside space around the church, other than a graveyard, which she says would present issues when holidaymakers letting the property wish to have a barbecue, or play music and have a drink. Another resident, Angus Mackenzie, questioned the point of local planning in light of Mr Morgan’s second appeal.